Is the rising cost of education altering Generation Z’s outlook on higher education? Millennials have made headlines a countless number of times for taking on student loan debt with a lack of knowledge on how to pay it off. For those born between 1996 and 2011, otherwise known as Generation Z, they’re taking the cost of college into consideration when selecting a school, payment plan and career path. We surveyed more than 5,000 students enrolling in college for the fall of 2017 to uncover what money saving strategies they would be taking on in the coming four years. 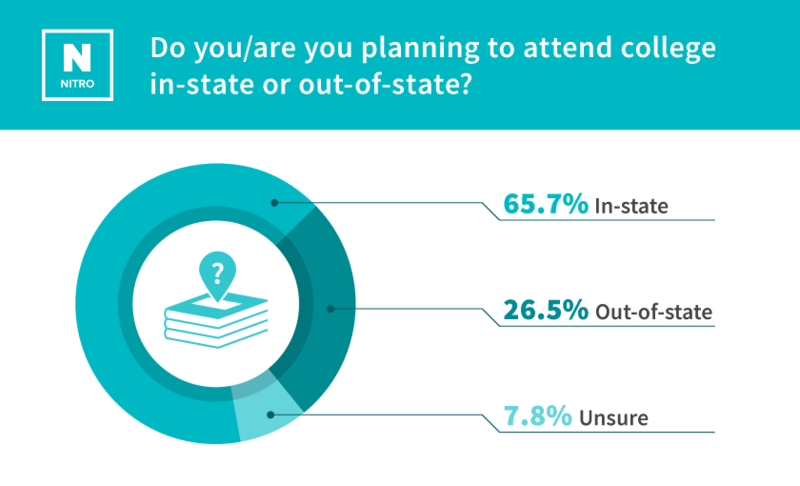 In our survey, we found that 65.7 percent of them are planning to attend an in-state school to save on the cost of tuition. With the average tuition cost for an out-of-state school more than double that of an in-state school at $24,930 per year, students are aware that taking on more student loan debt can set them back financially after graduation. Of those students who plan to attend an in-state school, 19 percent plan to live at home and commute. Although room and board can be covered through scholarships and financial aid, it still comes with a hefty price tag. According to College Board, the average cost of room and board is $10,440 for four-year public schools—more than the average cost of in-state tuition at $9,650. 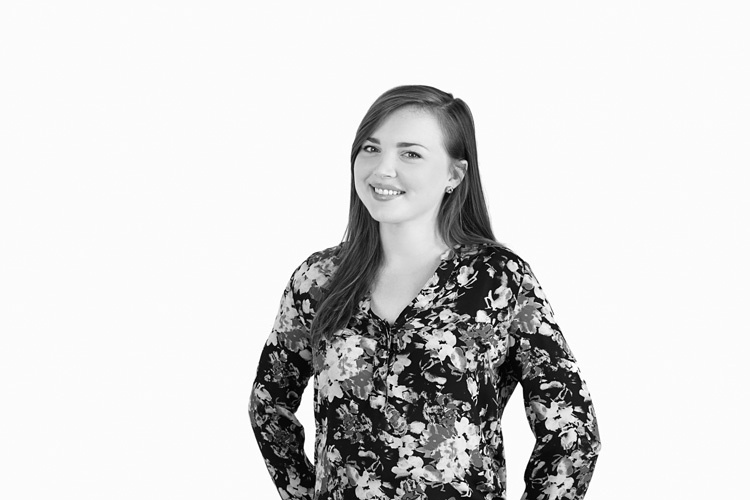 Millennials are known to balance choosing career paths in lower demand and lower pay fields. This mindset is slightly different for Generation Z, with 46 percent sharing their potential salary only somewhat affects their chosen major. On the flip side, Generation Z is aware of the potential value the right major has, primarily from the sizable media attention on student loan debt and their own family’s experience. We found that 70 percent of students have relatives who attended college and set an example for their undergraduate career. Whether they’re paying back student debt, or landed a job out of college with an in-state degree, it’s apparent that the older generations are using their experiences to educate Generation Z. The majority of Generation Z is realistic about potential earnings, with 50 percent anticipating to earn under $45,000 one year post-graduation. 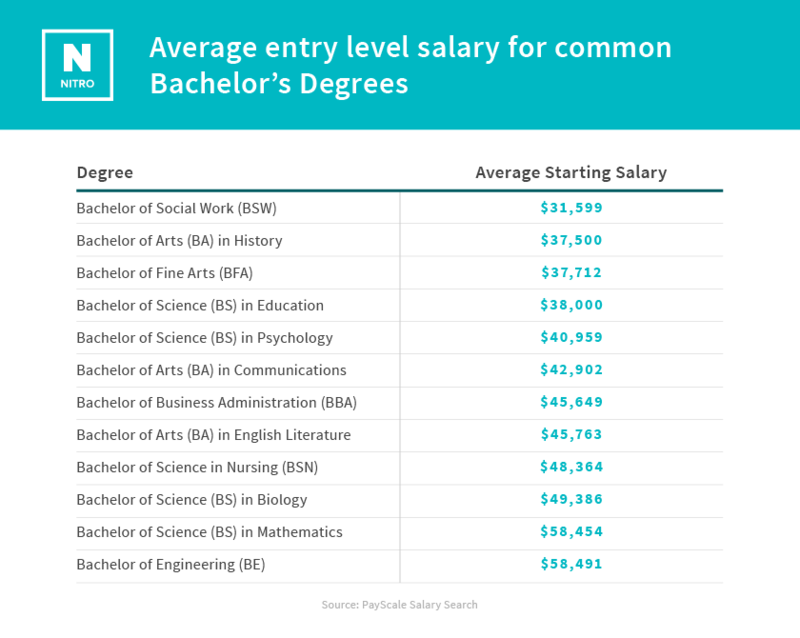 To get a sense of the average starting salary for a variety of bachelor’s degrees in the U.S., we pulled data from PayScale to create the table below. Note that entry-level salaries vary depending on the career path. Although only 9.4% of those we surveyed have more than $5,000 saved up for college, Generation Z is willing to prioritize paying for college over certain qualities of life. Moving out of their family’s home, driving their own car and dining out are among the top expenses that they are willing to sacrifice. Even though Generation Z is said to be more financially cautious than Millennials, the cost of college for state schools is still beyond the means of any student enrolling in college. 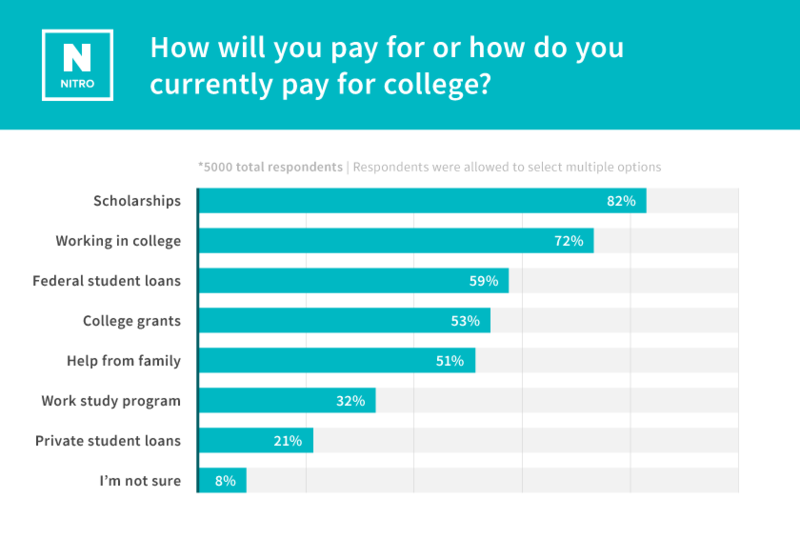 We asked students how they plan to pay for college and found that 82 percent of students plan to use scholarships to supplement the cost of college. Not far behind were students who plan to work while balancing a full course load. Overall, Generation Z is more aware of how student loans can greatly affect their finances after graduation, but still pursue a major based off passion over a starting salary. We analyzed data from our March 2017 student scholarship survey, which collected responses from 5067 students enrolling in college in the Fall 2017 semester. For the starting salary breakdown by college degree, we pulled findings from the salary search on PayScale.